Memory Support is different here! When your loved one wakes up in the morning they will find themselves in a familiar setting surrounded by people who love and care about them. 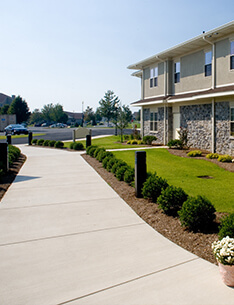 People experience a fuller quality of life in Laurel View than they would in the confines of their own home. We work with you to discover the things that breathe purpose and meaning into their lives and we do our best to provide those same opportunities as much as possible. Routine, activity, exercise, nutrition, excursions, rest, reading, all the things that keep us going are integrated into life at Laurel View. Well being comes from being involved and there are lots of opportuntities to be involved. Then there's the medical side: doctor visits, medications, dentist appointments, hygiene and the like. Our caregivers are full of love with a passion to serve and just as important they are professionally trained so you know your loved one is getting the best of both worlds. Life doesn't stop happening here; it simply adjusts to an individual's situation. We understand the dynamics of memory loss so you can be sure they're getting person first attention and flexibility that draws upon who they have always been. Understanding the options of the future is important. No one makes the decision to move to memory support on their own. Family often makes that decision because they know it's best for their loved one. The decision is one of caring and love and i'ts important to recognize that fact. People have a richer, fuller quality of life in Laurel View than they would in the confines of their own home. Garden Spot Village has a Person First culture. Enriching the life of your loved one is at the heart of what we do.